← Hop, Skip and Jump for Joy! The first thing I thought was “They sent her a feather!” Love it! what a perfect angelic picture! Thank you! I am so excited that it came out so well! I actually saw two angels on the sky last week, two days in a row. The first I was able to get a picture of and it was kind of looking down and praying. The second was just like the top half praying and had something that looked like a dog beside her (the last dog that I had I found dead in my dog pen). I didn’t think to grab my phone and by the time I got my camera it was gone. These were the first time I saw angels in the sky. Oh, I believe! I can find a white feather in the most unusual places, right in my path, especially when I ask for a sign, too. Our angels will always validate their presence. We just have to be open when the validation happens. I love your feather cloud!! I am so honored! Thank you so much Dan! I appreciate it! I love your blog as well! Viva España! Hi! My angels like to turn on my fireplace or printer! Angels have a sense of humor. Once I was eating Cookie Crisp cereal and the little chocolate chips looked like two eyes and a smiley face! One Christmas morning I asked for a sign and I found a happy face on my deck in the snow! My favorite is asking them for a close parking spot and they always come thru for me!! I have lots of pictures with orbs in them! That’s my angels!! The Angels are confirmating that they are there for you. How reassurancing…. I am waiting for my feather too. 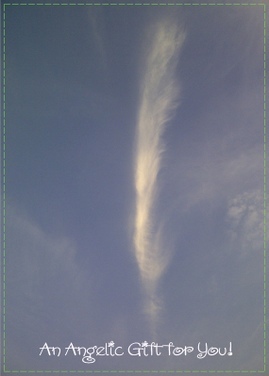 Amazing, looks like a feather towards heaven. Wonderful. My maiden name is DeAngeles (of the angels – in Italian) – and my mother collected angel things. In my home I have an “Angel Room” with her collection and a lot that I have gathered through my life-time. When we bought this house, the lady who owned it used that room upstairs for her yoga and massage parlor, but on the window ledge, she had a glass angel. After we moved in, she came to visit. She saw how I was using the room as my sanctuary. Next time she visited, she returned the glass angel to its “home.” I believe in angels. They are all around me. I have a million stories about the way they have saved, enlightened, and strengthened me. Thanks for this posting, Misifusa. Your presence in this blogging world IS a present!